Please refer to our stock # 028202 when inquiring. 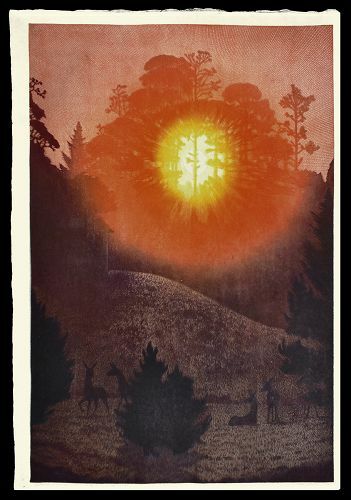 Original pencil signed Japanese woodblock print by Toshi Yoshida (1911-1995), titled Mendocino, Sunrise, 1982. This is one of Toshi Yoshida’s largest prints, measuring approximately 31 1/2 x 45 1/4 inches, plus full margins. This design was issued in a limited edition of 300, although this particular print is marked “Hozon” in Japanese in the bottom margin. Hozon translates as "to keep" (essentially, an artist's proof). It is in very good condition, with no issues to note.